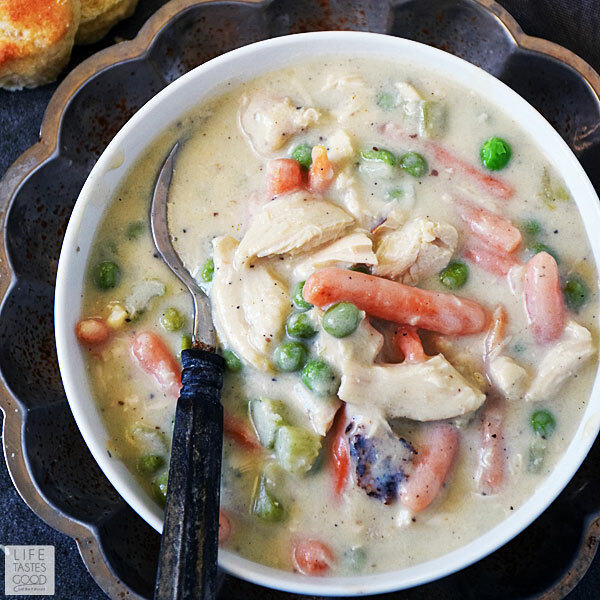 Creamy Chicken Pot Pie Soup is all the comforting goodness that makes up the inside of chicken pot pie without all the fuss of actually making it into a pie. With chunks of succulent roasted chicken, crisp vegetables, and a rich, creamy sauce, you'll close your eyes and savor every spoonful until you empty the bowl...and then you'll go back for more! Did you know that June is National Dairy Month? It's Undeniably Dairy true! In honor of National Dairy Month, the Sunday Supper Tastemakers have teamed up with the Florida Dairy Farmers to bring you our best recipes made with milk, so you can add milk to your diet throughout the day in the form of breakfast, lunch, dinner, and, of course, dessert (our favorite part!). Milk is not just for the cereal bowl! It is a versatile ingredient that can be used in your daily cooking routine from breakfast to dessert and everything in between. 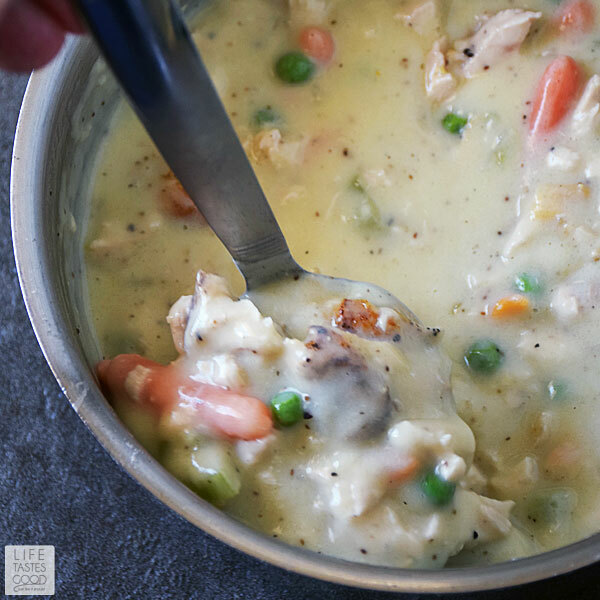 My Creamy Chicken Pot Pie Soup recipe has a smooth creamy texture because I use whole milk to keep it a simple, fresh, and delicious recipe! 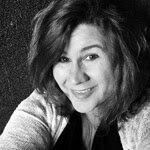 In addition to this creamy soup recipes, I use milk to my Pumpkin Spice Donuts, creamy pasta recipes, Bechamel Sauce, Slow Cooker Oatmeal, Pastry Cream, and so much more. I love the versatility of milk! I like to serve this creamy soup with homemade buttermilk biscuits, but I hear it's great over rice too. Don (my hubs) especially likes it over rice. If you read my blog, you know we are not compatible when it comes to rice. He LOVES it and just about every meal he says "you know what this would be good with....", and I always answer, "ummmm....let me guess, RICE (with an eye roll, of course) haha. Too bad for him I'm not as big a fan of the fluffy white grains. It's not really the taste, it's the consistency (that's a nod to ZombieLand). Start the roasted chicken breasts first. While the chicken is roasting in the oven, make the soup on the stove top in a stock pot. As always, taste as you go and adjust seasonings to your liking by adding a little bit at a time until it's just right. Use an instant read thermometer to check the doneness of the chicken. By the time the chicken is cooled, the soup should be thick enough to add the chunks of roasted chicken and serve. Try to resist the urge to snack on the roasted chicken breasts while they are cooling. It's a struggle for me. I recommend cutting up the crispy, roasted chicken skin and adding it right into the soup with the succulent pieces of chicken. It will enhance the comforting roasted flavor that really sets this soup apart from the rest. 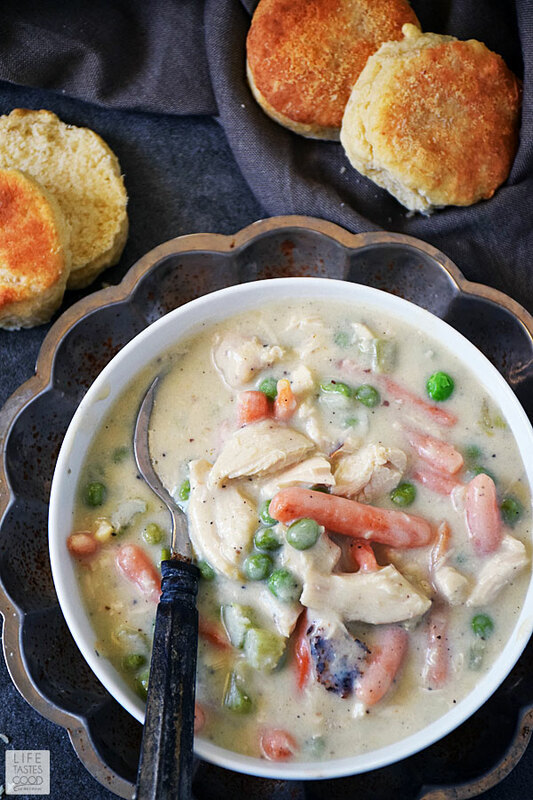 If you want to serve this soup with buttermilk biscuits, the order of making it would be to get the chicken roasting in the oven, start the soup simmering on the stove top, and then make the biscuit dough. Pop the biscuits in the oven when you take the chicken out. By the time the biscuits are done, the chicken will have rested and be ready to go in the soup. Quick and efficient. Just the way I like to cook! Serve in a bowl with a spoon is a simple way to enjoy this soup and perfectly pleasing. Although this soup can stand alone with just a spoon, it is even better if you take the time to make some buttermilk biscuits. Put a biscuit in the bowl and spoon the soup right on top of it. So good! My favorite way to enjoy it. Or be like Don and serve it over rice or even pasta. It's a versatile recipe you can enjoy however you like. 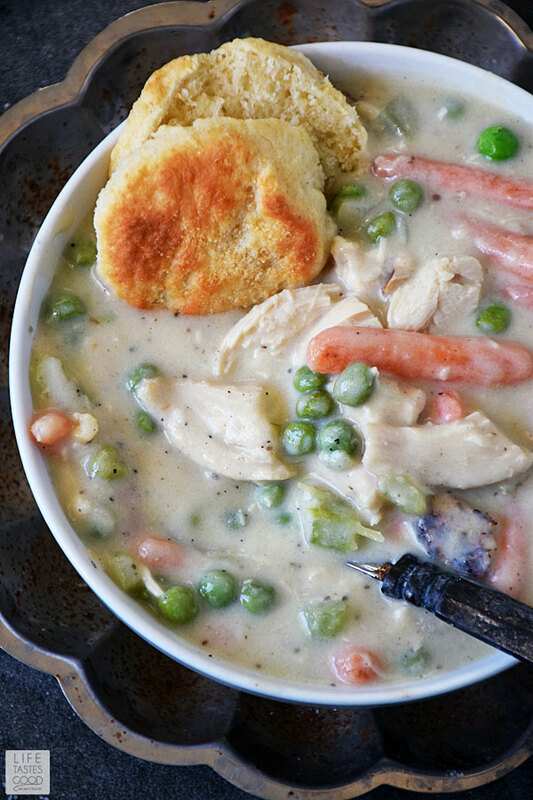 All the comforting goodness of chicken pot pie without all the fuss! Make life taste good with Creamy Chicken Pot Pie Soup today! Prepare the Roasted Chicken Breast as directed in my recipe. Click here for my Roasted Chicken Breast recipe. While the chicken breast is roasting in the oven, melt 1/3 cup butter in a saucepan over medium heat. Add 1 cup carrots and cook until they start to soften (between 3-5 minutes). Then add 1/2 cup chopped celery, 1/3 cup chopped onion, and 1 cup frozen peas. Cook until veggies are tender. Add 1/3 cup flour, 1/2 teaspoon salt, 1/4 teaspoon black pepper, and 1/4 teaspoon celery seed and stir to coat the veggies. Slowly stir in 1 3/4 cups water and 2/3 cups milk. Add 2 teaspoons chicken base, and reduce the heat to mid-low. Give it a taste and adjust the seasoning to your liking. Simmer until thickened. Once the chicken is rested and cooled slightly, remove the meat from the bones and cut into bite sized pieces. Add chicken to the soup. Don't be afraid to toss the skin in there too! It adds great roasted flavor! Enjoy! NOTE: This recipe is easily doubled if you need to feed a crowd or, if you're like us and just want leftovers. I love the versatility and easiness of the recipe. I am in both camps: biscuits and over rice. can I get your biscuit recipe please?? Fabulous recipe. I cheated a tad and used a rotisserie chicken to cut down some time on a week night. Still fabulous. Thank you for sharing. my daughter made this for her and her husband. she brought me a bowl to try! it was amazing! they did the buttermilk biscuits. i ate it as is, like a bowl of stew. just delish!! This was a hit in my house. It taste great. Going to add it to my recipe box. Have you frozen the leftovers before? I'm wondering if it would freeze well with the cream base. Yes. Use a big pot and follow the instructions with double the ingredients. Enjoy! For this dairy free house I used olive oil with the cooking of the veggies and Almond Milk instead of cow milk. All turned out great! Just made it for the Super Bowl Game and oh... so yummy! This has been added to my Pinterest Board so I can use it over and over again. Thank you!